Unique Seaflex (Seaflex), a division of Unique Maritime Group, are delighted to report their key involvement in the re-floating of the only surviving landing craft from D-Day 1944. Working in conjunction with Salvesen UK, Seaflex deployed 230t of buoyancy from its office in The Isle of Wight to the operation in Birkenhead Docks Liverpool. The project to lift and save LCT 7074 began in March 2014, almost exactly 4 years to the day after she had sunk. 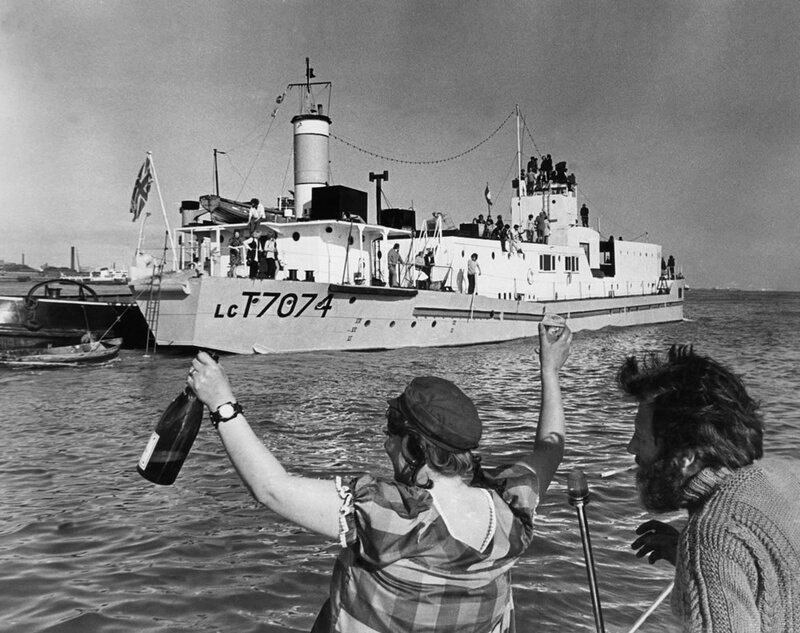 The vessel came out of service at the end of the WWII after numerous successful deployments to the Normandy beaches; she was converted to a naval repair facility for a short while, then became a floating nightclub, and was berthed in Liverpool from around 1950. Salvesen UK, a Liverpool-based contractor established for over 40 years and now conducting over 1000 diving projects a year, were engaged by Comet Technical Services on behalf of the National Museum of the Royal Navy to conduct a dive survey and some NDT inspection of the vessel during March, the result of which was that the hull was deemed in good enough condition to attempt the refloat. A grant of nearly one million pounds was awarded by the National Memorial Heritage Fund and operations recommenced on the 22nd of September. After three weeks of diving to clean the vessel and prepare her for internal diving operations, the landing craft was ready to be refloated. Although for salvage operations open-ended parachute-style air lift bags are generally preferred, this was one of those jobs where a combination of the relatively shallow depths and the need to squeeze buoyancy into tight spaces meant that enclosed units fitted with pressure release valves were the ideal solution. A significant number of such enclosed units as well as parachute-type lift bags are held by Unique Seaflex within their rental pool for near-immediate despatch and just-in-time delivery by Unique Seaflex for such projects. Salvesen began by installing 18 x 5t single-connection vertical Unique Seaflex Mono Buoyancy Units into the wing tanks, which run fore and aft, port and starboard. They then burnt holes either side of the vertical frames in the wing tank bulkheads to secure a further 20 x 5 ton MBUs. As these units would break the surface before the vessel was fully afloat, the full lift potential of 190t would not be achieved, but it would be supplemented by 8 x 5 ton multiple-connection horizontal Inflatable Buoyancy Units in the main engine room. They then successfully and safely tunnelled under the vessel’s approximate 10 metres’ beam, creating a 1.5 square metre aperture to allow 2 x 100t soft slings to be inserted; these were then restrained and connected to two spreader beams. A floating crane was then mobilised to assist with the lift, initially loaded to 50 tons. The lifting bags were then inflated sequentially so as to provide a stable and as controlled lift as possible with the stresses on the vessel being monitored throughout by digital strain gauges at various locations on the hull. With all the bags inflated, the load on the crane was increased at 5 ton increments, and at 105 tons on the crane the vessel slowly began to rise from the seabed. After the tank deck level was reached, approximately 400,000 litres of water was pumped out and the vessel was successfully refloated. All the salvage equipment was then removed from the hull and final preparations made for her transfer to Portsmouth Naval Base for restoration.